The moment is indelibly burned into Dato Zhvania's memory. It had been a day like any other - a day of back-breaking, painstakingly meticulous work. A day of throbbing, enervating heat. But as he sifted gingerly through the baked patch of ground before him, his fingers touched something different. The archaeological site at the medieval town of Dmanisi, 80 kilometres (50 miles) south-west of the Georgian capital, Tbilisi, had already revealed some of its secrets. Perhaps, just perhaps, this was his turn. But what emerged as he brushed away the earth was to far exceed his expectations. 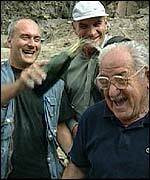 He did not know it yet, but in his hands he held the almost perfectly preserved skull of the most ancient human being ever found in Europe - 1.8 million years old. More extraordinary still, it was about to throw into question all accepted theories about the migration of our ancestors out of Africa. Dato could not contain his excitement. A message was sent out to team leader, Davit Lortkipanidze, a paleoanthropologist at the Georgian State Museum in Tbilisi. The media were alerted and Dato and his colleagues prepared to celebrate. "The first thing we did was pool together all the money we had - around about $800. Then we drove around all the villages for miles around and bought every bottle of champagne we could find." He shakes his head and smiles to himself at the memory. We were standing at the spot where the skull had been found, deep beneath the foundations of the medieval town. "And you know," he said, "this site is so big and so important that what we've found so far could be nothing compared with what still lies beneath the ground." The remains of seven individuals have been found at Dmanisi - the most recent this summer - but what made this discovery so special was that it did not look like the skull of any human ever found outside Africa before. Its brain cavity was far smaller - half the size of a modern human - and it had the huge canine teeth and thin brow of an ape. 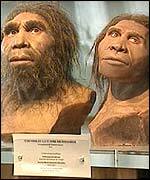 This was not the tall, upright, big-brained Homo erectus we had assumed the first humans to leave Africa to have been. This guy was short, long-armed and probably trailed his knuckles along the ground. Not only that, the tools found around him were basic choppers and cutters, just like those found at the sites of early, primitive men in Africa. 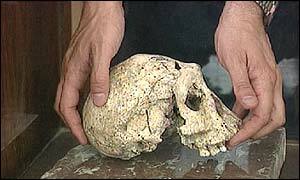 Dato Lortkipanidze thought he recognised Homo habilis, a hominid with a close resemblance to an ape. But what was he doing in Georgia? The theory had always been that the migration out of Africa had only happened with the evolution of big brains and the development of the tools and hunting skills to make the exodus possible. The discovery has opened so many questions about our ancestry that one scientist quipped: "They ought to put it back into the ground." Another unusual aspect of the Dmanisi find is that it was discovered in the same layer of sediment as other hominids with substantially larger brains - Homo erectus. Mr Lortkipanidze suggests the variation may force us to rethink the definition Homo. 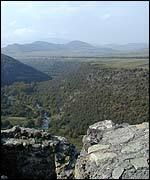 The old town of Dmanisi sits atop a promontory formed by the confluence of the Mashavera and Pinezauri rivers. Today, it is a picnic spot for visitors from Tbilisi who come to see the ruins of the early medieval church and castle. Modern Dmanisi is a short drive away and just a small village, but this was once an important stopping point on the Silk Route - a trading centre between Byzantium and Persia. When I stood on the battlements above the church, I could easily make out the road the camels used to take and the steam baths once used by the traders. It is a place of steep slopes and whispering winds, of forests and basalt cliffs, but to the north a plateau of cultivated fields stretches away to the horizon. This was once savannah - home to rhinoceros, game and sabre-tooth tigers. Perfect hunting ground for hungry hominids. Gazing out across this scene 1.8 million years after our ancestors stumbled out of Africa, I spotted a group of Georgian villagers cheering on a wrestling match amidst the ruins - a reminder that strife has been the defining characteristic of our existence ever since. But for Europeans, Dmanisi is a reminder of something else too. This, it seems, is where our history began. Dmanisi recalls our common origins. Robert Parsons reported from Dmanisi for Europe Direct, which can be seen on BBC News 24 on 11 January at 1130 GMT, and on 12 January at 0230 GMT and 1430 GMT. The programme can also be seen on BBC World on 15 January at 2230 GMT, on 16 January at 0230 GMT, 0930 GMT and 1730 GMT, on 18 January at 1630 GMT and 2330 GMT, and on 19 January at 0230 GMT and 1930 GMT.